You must be aware that CA - FOUNDATION Exam shall be held on 10th, 12th, 14th and 16th May, 2019. To appear for CA- Foundation Examination, one is required to fill TWO FORMS. You must have got registered with ICAI by paying a sum of Rs.9,200 on or before 31st December, 2018. The Examination Form can only be filled online. (There is no provision to fill examination form offline) You are required to fill the Examination Form directly online at institute's website i.e. http://icaiexam.icai.org at anytime on or before 12th March by paying Rs.1,500 through Visa/Master/Maestro Credit/Debit Card. Step 1 : Download a DECLARATION FORM, fill it and get it attested. (If you wish to get your FORM attested from us, Kindly deposit the Declaration FORM at reception on Monday (4th March) and Exam form on Wednesday (6th March). You can collect the form the next day. The declaration Form can be attested by any member of ICAI or Head of Educational Institution or Gazetted Officer. Do get your form signed from your parent/guardian before attestation. Step 4 : If you are appearing for first time for CA-Foundation Exam, click to NEW USER. In case of any difficulty in creating Login ID, don't feel disheartened. ​The process of registration is explained under "FAQs >> Help on Registration" and "FAQs >> Help on Applying for Exam". (Kindly keep your Login-ID and Password safely with you since the same will be required by you while filling up any examination form upto the "C.A. Final Examination"). Step 5 : Fill your information, verify your email ID and mobile number. Step 7 : Fill the appropriate details. Date of Registration to Foundation Course : The date of registration is mentioned on the letter/ mail issued by ICAI that from this particular date, the student is been registered with ICAI. This date is not written on any other document. If you have not received the registration letter / mail, please contact ICAI. Your PERSONAL IDENTIFICATION NUMBER (4 DIGIT PIN) : You can write any 4 digit number but we strongly recommend you to fill as "3345". % of marks secured in 12th class : Write aggregate percentage of 5 main subjects. Details of Latest Previous appearance in Foundation to be filled by students who have given Foundation exam before. For new students, leave this column. Centre Selection : You can fill any region as your examination center irrespective of Registration Zone. ​To Select your examination zone please click the below mentioned icon. Question paper Booklet language : English / Hindi as per your preferred Language. 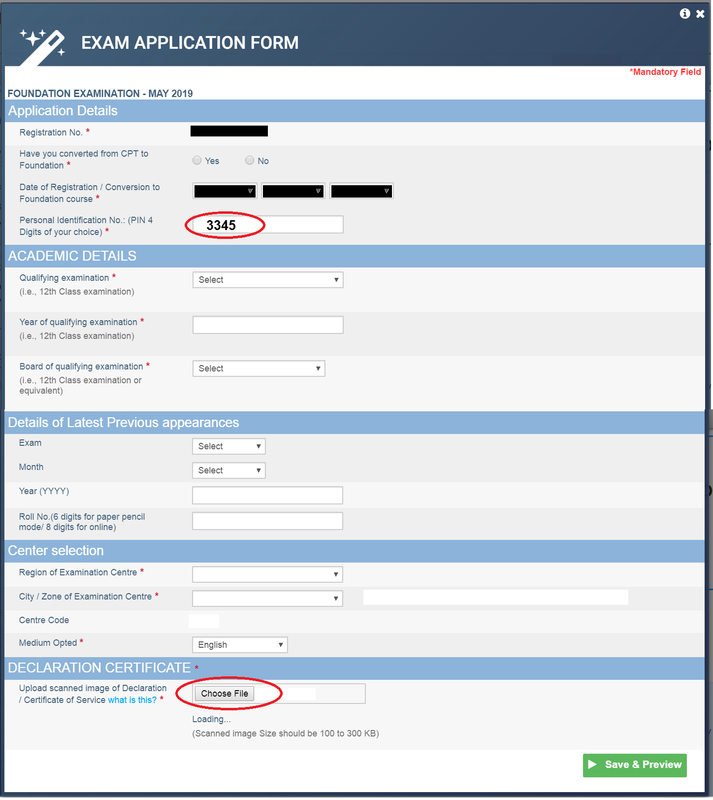 Step 8 : Upload the scanned copy of Declaration Form. Step 9 : Make the payment of Rs.1,500 through a Visa/Master/Maestro Credit/Debit Card. Step 10 : After making the payment, a PDF file will be generated. Download the PDF file, take its print out, get it attested and deposit the hard copy of Attested Form at ICAI Bhawan by 25th March. It is highly recommended to keep a photocopy of the attested examination form with you as well for future references. "Exam Application Form - FOUNDATION, MAY 2019"
so as to reach him on or before 25th March upto 5 PM. Submission of ScreenShots taken while filling the form online Or the Payment Receipt Or any other paper will NOT be treated as successful online application. The printout of PDF containing the Barcode Number and Payment Transaction Details is required to be submitted. Candidates are advised not to send their filled up form through private courier services. No responsibility for late/non-delivery will be taken by the ICAI. Please do not send more than one online form in one envelope. 1. On printing of admit card from website, the student should verify his Name, Registration Number, Photograph, Signature, Centre, Language of Question Paper Booklet, etc. In case of any discrepancy, Helpline Desk should immediately be contacted. 2. The circles in red are the places where the student and his guardian is required to sign the document. Important: Signature of student shall be kept by ICAI till CA Final, so make sure you remember your signature for next 4 years. Further the student is required to sign at two places; make sure both signatures are same. 3. Both photographs must be the same and with prescribed dimensions. This photograph will be scanned by ICAI and will be printed in all future documents, so get the best photograph clicked. Photographs have to be pasted and not pinned/stapled. Recent passport size photographs are necessary. 4. 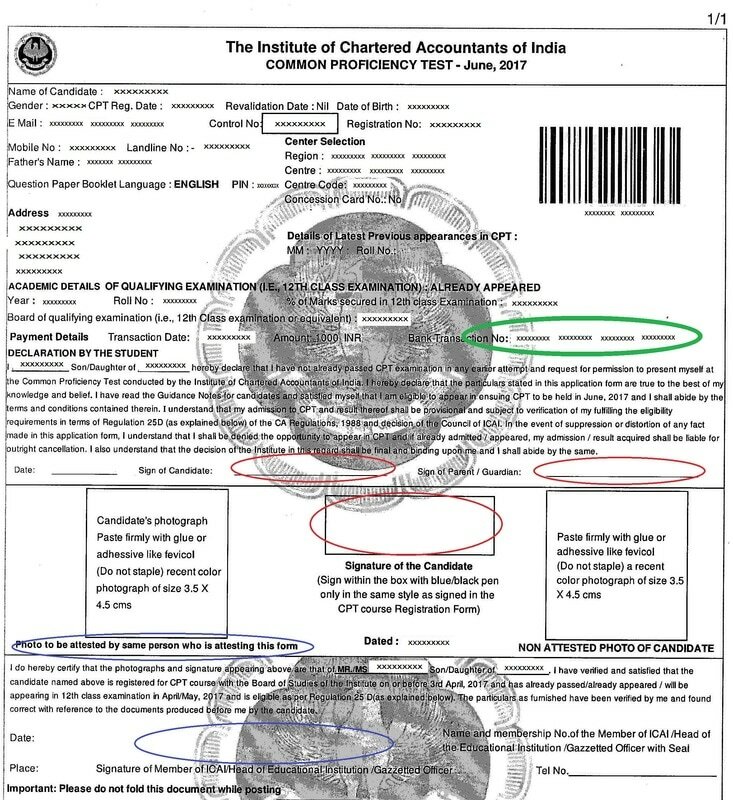 The circle in green (as highlighted in above examination specimen copy) must have Payment Transaction Detail. 5. The circles in blue (as highlighted in above examination specimen copy) are the places where the form has to be attested. The attestation has to be done on the photograph with signature across the photograph preferably along with seal. ​The Declaration Form as well as the Examination Form can be attested by any Chartered Accountant/ Head of Educational Institution/Gazetted Officer. ​In case you still have any doubt in filing Examination form, click on the below mentioned area of the ICAI website. In case of any difficulty, contact ICAI Helpline Desk whose numbers can be obtained from the ICAI.org site. Helpline Telephone Number (10am - 5pm) : 0120-3054851, 3054852, 3054853, 3054,835, 4953751, 4953752, 4953753, 4953754. 1. We strongly recommend you to view all the three areas mentioned through RED circle above. on http://icaiexam.icai.org. i.e. Guidance Notes, FOUNDATION MAY 2019 exam details and Online Exam Form - MAY 2019 and read all the instructions carefully before filing the online application form. We have tried to compile all the information from the above links but still may have missed any point. 2. Make sure that when you sign your initials in the examination form, it does not exceed the space provided to you. Your photograph and signature shall be scanned and printed on the admit card as it is. 3. You are required to deposit the hard copy of filled up form duly attested by any chartered accountant or any gazetted officer at ICAI bhawan. Declaration Form need not to be deposited. 4. 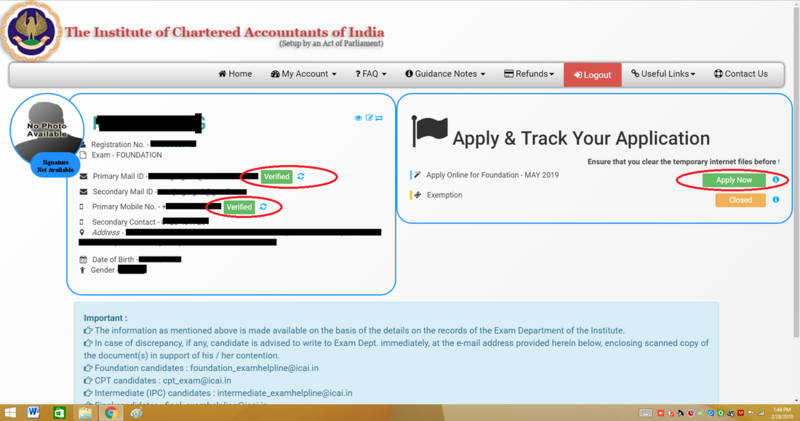 Regarding examination centre, check your centre at above green icon "http://icaiexam.icai.org". 5. Carefully fill the 4 digit Personal Identification Number(PIN No.) as it is required to download the Admit Card and Mark Sheet. It is strongly recommended to fill the PIN number as "3345". 6. If you haven't received your registration number, you can call up at ICAI helpline to know your registration number. 7. You are eligible for May 2019 attempt only if you have registered yourself with ICAI on or before 31st December 2018. 8. Admit cards of all the candidates will be hosted on http://icaiexam.icai.org generally 14 days prior to the commencement of the examination. All candidates are required to print their admit cards from the website icaiexam.icai,org. through their log-in IDs. No physical admit card will be sent to any candidate. 10. A candidate shall be declared pass if he secures 40% in each subject and 50% in aggregate. There is no concept of Exemptions in Paper(s) in the Foundation Exam. 12. The student can leave the examination hall 1 hour after the commencement of exam in Paper 1 and Paper 2 but can leave after the conclusion of exam in Paper 3 and Paper 4. ​13. If a student feels that any question asked in any subject was out of the syllabus or outside the ambit of the level of knowledge expected as laid down in the syllabus or the language used in the question paper was ambiguous or any other valid reason he may, send his representation to the Joint Secretary (exams) so as to reach him within a week from the last date of the examination in the feedback form hosted on www.icai.org. 14. The result is likely to be declared in the third week of July, 2019 at icaiexam.icai.org. Candidate securing a minimum of 70% marks will be declared "Pass with Distinction". Merit List upto 50th Rank will be declared. All the above mentioned information are true and correct to the best of our knowledge and belief. However, M.K.GUPTA CA EDUCATION takes no responsibility for examination forms filled incorrectly by students.